Original Content: Why Am I Not Good Enough? 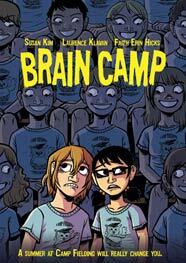 I found Brain Camp by Susan Kim, Laurence Klavan, and Faith Erin Hicks on my To Be Read pile a couple of months ago. It was part of my haul from a used book sale last year. The style of the cover seemed familiar to me, and I realized that Faith Erin Hicks' book Friends With Boys was a Cybils book last year. In fact, it was the winner in the YA graphic novel category. Hicks copyrighted the illustrations, and after reading Friends With Boys, it is easy to recognize her work. Brain Camp is sort of a traditional nightmare camp story. In this case, parents send their average, or less, maybe, achieving kids to Camp Fielding, "America's best new educational summer camp, guaranteed to prepare any child for the SATs and beyond." The camp administrator looks for kids who "got turned down for math camp, computer camp, art camp..." and have never done well on a test in their lives, to paraphrase one mom speaking of her son. The kids leave camp stellar students because of a mysterious plot, which our two intrepid, and not at all gifted, protagonists discover. The really intriguing part of this book wasn't the story itself but the feeling it carries of its characters being unacceptable to their families as they are. Love is not unconditional for the children who are sent to Camp Fielding. In the course of the book, we learn just how conditional it is. Yeah, there's a science fiction plot here, but it's the mood that makes readers feel that these children are being thrown to the wolves by the adults who are supposed to love them simply because they can't conform to a standard of achievement that makes Brain Camp striking.